With the 2018 Atlantic Hurricane season already upon us, and the images from last year’s catastrophic season still fresh in our memory, resiliency and disaster preparedness are on everyone’s mind. 2017 was the most expensive year on record for damage from climate and weather disasters, with cumulative costs reaching $300 billion. It was also among the most dangerous, with one-third of all counties in the country issuing declarations of disaster. On July 12, the Congressional Green Schools Caucus held a briefing on school facility investment to promote resiliency and disaster preparedness. 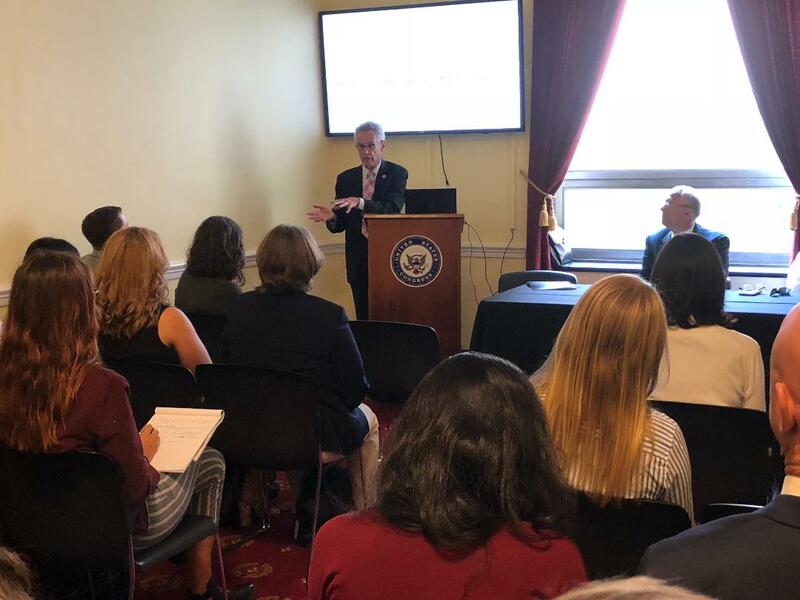 The briefing opened with Rep. Alan Lowenthal (CA-47), the caucus co-chair, speaking to the importance of resiliency in school buildings. Rep. Lowenthal talks about resiliency at the Congressional Green Schools Caucus briefing. Next, a panel discussion was held on the role of public school facilities in strengthening community resilience through strategic investment. Led by Anisa Heming, Director of the Center for Green Schools, the discussion featured three prominent figures in school resiliency design: Tim Cole, the Sustainability Officer for Virginia Beach City Public Schools; Clay Nesler, the Vice President of Global Sustainability and Industry Initiatives for the Building Technologies and Solutions of Johnson Controls; and Nate Allen from the Oak Ridge National Lab. Topics ranged from building codes to energy efficiency investment and infrastructure, all with the goal of educating lawmakers on the importance of strengthening community resilience by school building investment. Design for the 100-year storm, as opposed to the 10-year storm; create and provide community infrastructure; educate the community and city on resilience and mitigation measures—these are just some of the strategies that Tim Cole proposed at the briefing. Using examples of schools he has helped design, Cole advised looking past the required building code and designing schools with the future in mind. It's important to assess an area’s natural disaster vulnerabilities and implement building design strategies that prevent damage, he said. Such strategies include placing energy systems on the top floors of the building, designing robust stormwater management systems and choosing impact-resistant coverings for windows. Virginia Beach City Public Schools built beyond code requirements, making two of their schools the only Category 2 shelters in Virginia Beach. By providing models for future-focused design that takes climate change into account, the district has built an example of building resiliency for their community. Investment in energy efficiency is investment in resilience. Net zero energy schools are at the forefront of 21st century school design. Nate Allen provided examples of the national scale of net zero energy schools, particularly from non-urban and non-coastal areas. Allen also provided free tools for schools from the Department of Energy that guide energy-efficient design and financing. One tool mentioned was ASHRAE’s Advanced Energy Design Guide for K-12 School Buildings: Achieving Zero Energy, created last year as a guide for school stakeholders and designers. In addition, the Energy Department’s Zero Energy Schools Accelerator provides technical resources to facilitate school district staff in achieving zero energy, and the Re-Opt online tool assesses the feasibility of renewable energy and energy efficiency strategies. Create resilient energy infrastructure to maximize overall investment. The global trend in energy is showing an increase in energy positive or off-the-grid buildings. Energy positive buildings create more energy on site from renewable sources than they consume. The trend toward positive energy buildings parallels with the trend toward resilient buildings. Clay Nesler presented compelling data from Johnson Controls with examples of schools and universities that are pushing toward energy positive goals. Maui College. of the University of Hawaii, for example, is striving to be off the grid in 2019, with solar panels covering most of the building’s roof. Nesler talked about his experiences after Superstorm Sandy, which rendered many of the region’s gas stations and power lines inoperable, as a key lesson on the importance of resilient energy infrastructure. Giving examples of how net zero and energy positive systems can be created in schools, Nesler demonstrated that an investment in resilient energy infrastructure maximizes the overall investment in schools. Visit USGBC’s Center for Resilience to find tools that support strategies for resilient infrastructure.